The origins of Rotary Charity Fundraisers go back to the very first Ironman 70.3 UK event held in Sherborne in 2003. From the start Rotary were partners with Ironman. They provided marshals and stewards to run the feed stations, the course and car parking. A number of entrants indicated that they would like to raise funds for charity as part of their participation in the event. A member of the Rotary Club of Sherborne took it upon himself to organise an arrangement whereby the entrants could raise funds for a charity through the clubs charity fund. In 2005 Ironman 70.3 UK moved to Longleat and was replaced in Sherborne for the first time by Ironman UK. After four years the latter moved to Bolton and after one year Ironman 70.3 UK moved to Wimbleball. All this time the number of entrants in both events signing up to raise funds for a wide range of charities with Rotary continued to grow. 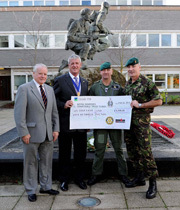 By 2010 the amount being raised exceeded £100,000 each year. The Rotarian concerned Terry Sherwood had organised and run everything himself. In recognition of his services he was made a Paul Harris Fellow by his club. In 2010 the Rotary Club of Sherborne Castles agreed to take over the running of the fund raising through their own Trust Fund. After a short while the club decided that a dedicated charitable company limited by guarantee should be set up to take over the ever expanding activities. All the charity participants became Rotary Charity Fundraisers and the charitable company Rotary Club of Sherborne Castles Fundraisers Limited was formed on the 29th September 2011. To cope with the widening range of events and activities the new charitable company has set up this comprehensive web site. All charity partner events have their own section, terms and conditions and entry arrangements. It is important therefore that you ensure you follow the instructions relevant to registering for such events. All individual entrant events and activities have to be pre-agreed with RCSCF before the registration process is started. All Rotary Charity Fundraisers receive a Fundraiser Pack after they have registered, accepted our terms and conditions and received confirmation that they have been accepted as an entrant for the event or activity.